The BuzzFeed offices in New York City. NBCUniversal Inc., producer of the Sunday morning talk show and the nightly network newscast, is investing $200 million in BuzzFeed Inc., the brash website made popular by listicles and clickbait. What in the name of Tom Brokaw is going on? What’s going on is a rather expensive effort by an old-school media giant to reach a younger audience. Just last week, NBCUniversal (owned by Comcast Corp.) poured $200 million into Vox Media Inc., whose sites include SB Nation, The Verge, and Re/code. Like Vox’s websites, BuzzFeed is popular among millennials, making it attractive to a legacy broadcaster whose industry is confronting a declining — and aging — viewership. Ratings for network newscasts have dropped 29 percent since 2000, according to Nielsen Media Research, with an average of 25.7 million people tuning in. In the past five years, the median age of primetime TV viewers has risen from 46.3 to 50.5, according to a Horizon Media analysis of Nielsen data. Some young viewers have cut the cable cord altogether, relying instead on streaming video services like Netflix. A survey published last fall by comScore Inc. found 24 percent of 18- to 34-year-olds do not pay for cable or satellite subscriptions. BuzzFeed, meanwhile, reports 200 million unique visitors and 1.5 billion video views in a typical month. “They reach a massive, loyal audience and have proven to be among the most creative, popular, and influential new media players,” NBCUniversal chief executive Steve Burke said in a statement. For a corporation the size of Comcast, which generated $68.8 billion in revenue last year, the spending spree of the last two weeks is relatively modest. But $200 million is big money in the news business — nearly three times what Red Sox principal owner John Henry paid to purchase The Boston Globe two years ago, and close to the $250 million that Amazon founder Jeff Bezos spent on The Washington Post around the same time. The fact that $200 million buys only a minority stake in BuzzFeed serves as the latest reminder of shifting media values. With the new infusion of cash, BuzzFeed, a site that didn’t exist a decade ago, is now worth $1.5 billion, according to some estimates. Media specialists added that NBCUniversal’s decision to invest in BuzzFeed, rather than attempt to launch a similar site that could rival it, is indicative of a broader industry trend. Craig cited Walt Disney Co.’s acquisitions of Pixar Animation Studios Inc., Marvel Entertainment LLC, and Lucasfilm Ltd. — all in the past nine years — as prominent examples of one media company buying another to reach a new audience. Not everyone is following the same strategy. The New York Times has increased its newsroom budget by 50 percent since 2008, to about $300 million per year, while developing new digital offerings and shedding business assets, including the Globe. This month, the Times celebrated 1 million digital-only subscribers. But in the case of NBCUniversal, “it makes more sense to buy in to BuzzFeed than to try to build something in their own kitchen,” said Rick Edmonds, media business analyst at The Poynter Institute for Media Studies in St. Petersburg, Fla. Some of NBCUniversal’s non-news properties — cable networks such as E! and Bravo, for instance — could be natural fits for BuzzFeed’s irreverent style. “We look forward to collaborating on television content, movies, the Olympics, and joint partnerships with ad agencies and brands,” BuzzFeed executive chairman Kenneth Lerer said. While BuzzFeed has built its brand on attitude and social media savvy, it also has constructed a serious news operation in recent years. Editor in chief Ben Smith, hired in 2011, is a former Politico reporter who has assembled a team that includes journalists lured away from the Times, ProPublica, and The Guardian. With foreign correspondents filing stories from Istanbul, Cairo, and Kiev, BuzzFeed’s on-the-ground reach exceeds that of many highly regarded news outlets. 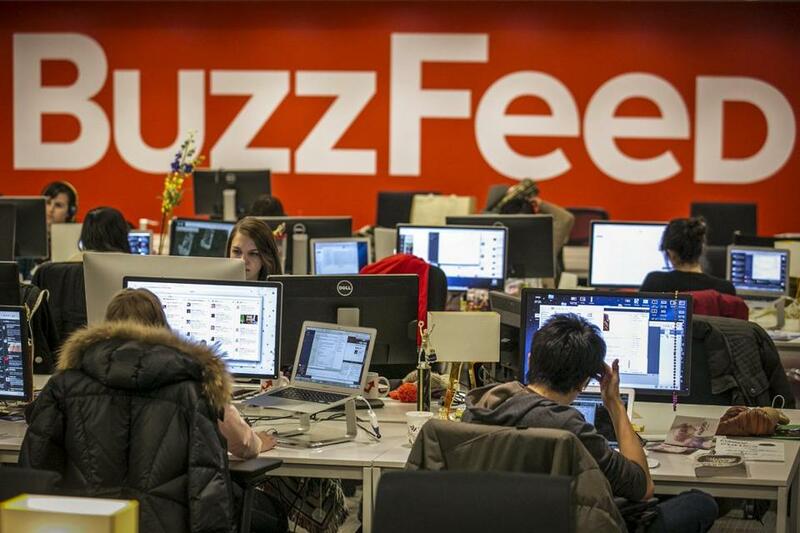 The site’s growth and diversification since its founding in 2006 have made BuzzFeed attractive to investors such as Andreessen Horowitz, the blue-chip venture capital firm in Silicon Valley, but NBCUniversal’s $200 million bet on the media company is by far the biggest. BuzzFeed had previously raised $96.3 million over five investment rounds, according to the high-tech funding tracker CrunchBase.